A rare albino wallaroo has been delighting staff and visitors at the Wolgan Valley Resort and Spa in the Blue Mountains, west of Sydney. "We've had sightings of one mature albino wallaroo on the property since opening 18 months ago, but to have two more spotted on the property is incredibly rare and exciting for us and our guests," the resort's general manager Joost Heymeijer said. 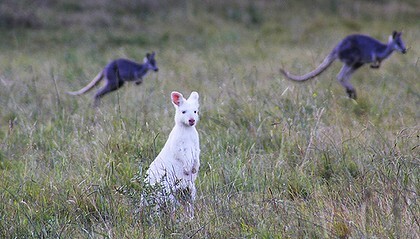 The resort's field guides have noticed the albino wallaroos are more timid and less trusting of humans than their grey brothers and sisters, and wait until it is darker to come out to feed. The education program co-ordinator at Featherdale Wildlife Park in Doonside, Peter Spradbrow, said albinism is a rare condition where the skin, hair and eyes lack the pigment that gives them colour. It is observed across many animal species, but in the wild it is difficult for an albino creature to reach adulthood. 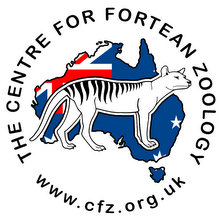 For more examples of albino macropods, check out earlier CFZ posts.